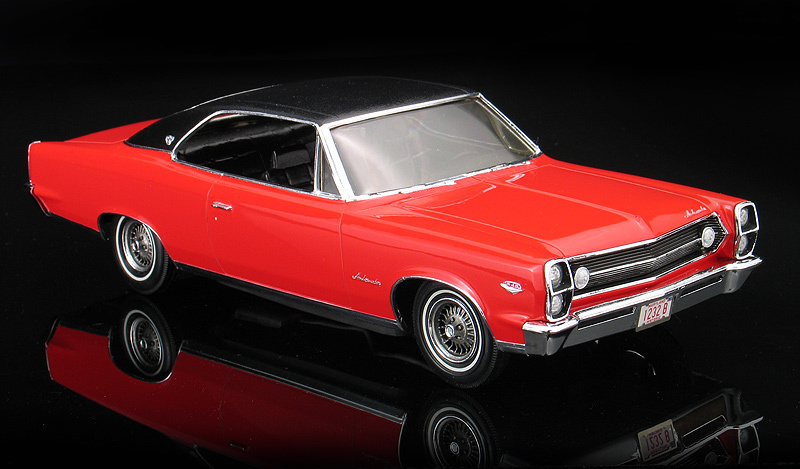 In the 1960's and '70's almost all American automobile manufacturers made 1/25th scale "promos" of their full sized cars. These were often given away to children at the dealerships as a promotional item. Growing up as a kid I was always excited when it came time for my dad to get a new car because I knew it was a chance to get the latest dealer promos and I still have a few from my youth. The model kit manufacturers coveted the contracts to make these promos because the tooling was mostly paid for by the full size car makers and they could easily be turned into model kits once the promo run was completed. AMT and MPC split the contracts for the most popular cars (like Fords and Chevys) while less popular brands like AMCs, Oldsmobiles and Cadillacs went to the much smaller Johan. 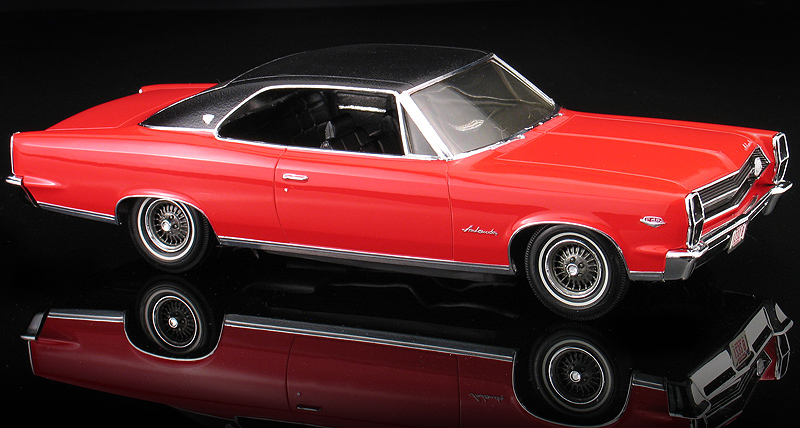 During the '60's, AMC cars were a staple of the Johan model company and they produced dozens of Ramblers, Rebels, Marlins, Javelins, and Ambassadors. Occasionally, in addition to the promos some cars were also offered as AM transistor radios. I have an affection for all automotive things quirky and rare. Because AMC cars were less popular when they were new, kits and promos of these cars are also rare which make them highly desirable today. I'm always on the look out for AMC cars, especially those of the V-8 powered muscle car variety. When I saw this Johan '67 AMC Ambassador DPL promo going for cheap on ebay I snapped it up because I thought it would make an unusual car to re-do someday. As you can see from the photo, the original condition of this Johan '67 American Motors Ambassador was rough. It was of the promo / AM transistor radio variety and did not have a stock interior or chassis. It also featured a badly worn chrome plated body. Now doubt, this was some sort of a special promotional car, but as to it's original purpose, I have no idea. Perhaps a more knowledgeable promo collector could shed some light on why it was all chrome plated. At any rate, my ebay purchase had a clean, unbroken body which was all I really cared about. I then set about trying to locate a chassis and interior for it. I had a vision of making some sort of custom hot rod out of my AMC so I wasn't particular worried about accuracy. I just wanted something that would fit. I placed an post on the Model Cars Magazine web site to see if anybody had parts to trade for my Ambassador. These cars are pretty rare today, so I had little hope that someone might respond with my missing parts. To my surprise, a fellow modeler did respond with a correct interior bucket. One problem solved. Now for a suitable chassis. Luckily, I have a 700+ unbuilt collection. After lots of test fitting I discovered the chassis from an AMT '70 Buick Wildcat had a similar wheelbase and it was a drop-in fit to the body. Problem two solved. My "freebie" interior arrived without a dashboard. A quick check of the '70 Buick dashboard revealed it also was a drop-in fit in the Ambassador interior bucket. So, my AMC got a Buick transplant. Yes, I know the American Motors purists are cringing right now, but hey... it's my model. I can build it however I want. After disassembling the radio chassis, an overnight soak in the "purple pond" stripped all the old chrome plating off the body. I sent out the bumpers, grill and stock wheel covers to Chrome-Tech for replating. Then I sprayed the body with Tamiya bright gloss red which a close match for the factory red color. The body came with a vinyl roof molded-in. I decided that I wanted to build my Ambassador with all the stock trim so I kept the vinyl roof and sprayed it with various shades of flat and gloss black. During the build I kept going back and forth between building the Ambassador stock or going the pro-touring route. Since I still had the useable radio chassis, I decided to go both ways and build a stock and a pro-touring chassis that I could alternate displaying my Ambassador with. The '70 Buick chassis features the stock wheels at a stock ride height while I modified the radio chassis for the custom version. The radio chassis was hacked up extensively so I could get that "in the weeds" ride height. It rolls on a set of big and little Pegasus Hobbies "T"s. I swapped the front tires with some taller ones from my parts box. I couldn't find a suitably big and wide enough set of tires for the rear, so I made my own by cutting and splicing 4 Revell Mustang GT tires into 2 extra wide versions. Lastly, I added a set of my own resin cast Brembo brakes. Final details include custom license plates with Pro-Tech photo-etched frames and a set of aluminum exhaust tips.